EDP Europe offers a range of custom built 3 phase PDUs built for high power consumption equipment, making it ideal as a blade server PDU. As well as our range of Basic PDUs, EDP Europe offers a range of 3 phase PDUs built for high consumption equipment making them the ideal blade server PDU. The 3 phase PDU will accept a 3 phase input and can be custom configured with single style or a mixture of outlets per phase enabling you to mix C13 or C19 outlets to meet your requirement. The overall current rating of our 3 phase PDUs can be to 16A, 32A or 63A providing great flexibility. Branch circuit protection is offered as either integral fuse or individual re-settable thermal trip per oulet. Our 3 phase PDUs are available in vertical or horizontal formats. Input Voltage: Three phase 400v. Input Connector: 5 Pin, 3 phase neutral and earth. Output Protection: Fuse or push to reset style thermal trip per outlet. Lead Length: 3m (Other lengths to order). 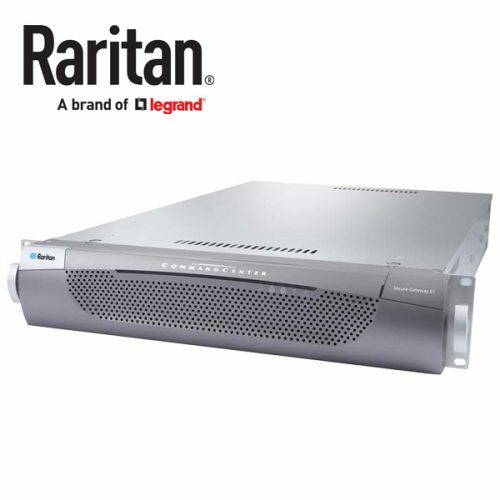 Case Size: 19” Rack mounted or vertical. Our 3 phase PDUs are custom built to the specification required. The below list are the 3 phase PDU models that we have already produced. If the 3 phase PDU you require isn’t listed please contact us detailing your requirement. 48-EDP-534-00-BL 3 Phase PDU, vertical mounting finished in Black. 7 x locking C13 outlets, 2 x locking C19 outlets and 1 x UK socket per phase. Coloured insert to indicate phase. 16A Thermal trip per phase with trip blown neon indicator. Supplied with a 3m H07 rubber cable terminated with a 32A 5 pin 3 phase Commando plug. 48-EDP-534-00-GR 3 Phase PDU, vertical mounting finished in Grey. 7 x locking C13 outlets, 2 x locking C19 outlets and 1 x UK socket per phase. Coloured insert to indicate phase. 16A Thermal trip per phase with trip blown neon indicator. Supplied with a 3m H07 rubber cable terminated with a 32A 5 pin 3 phase Commando plug. 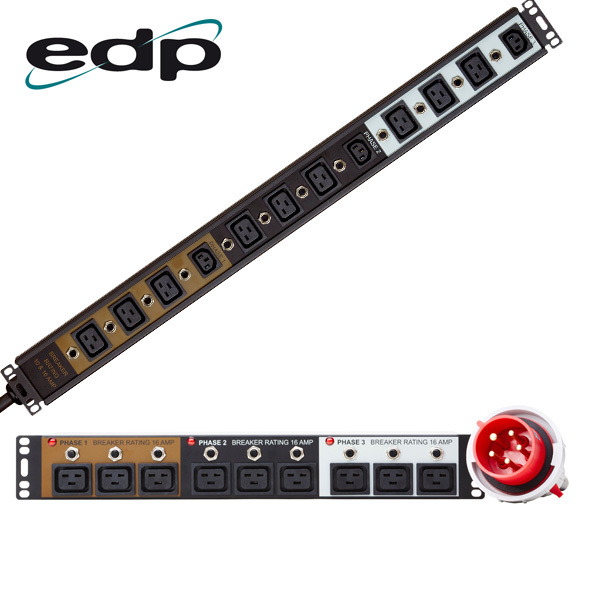 48-EDP-582-00 3 Phase PDU, vertical mounting finished in Black. 8 x C13 outlets and 2 x C19 outlets per phase with power present indicator. Fitted with a 3 phase true RMS digital ammeter. Supplied with a 3m H07 rubber cable fitted with a 32A 5 pin 3 phase Commando plug. Coloured insert to indicate phase. 48-E4-687-00-16B Vertical, slimline 3 phase PDU with 10 x C13 outlets, 2 x C19 outlets and 1 UK socket per phase. Each phase protected by a 16A thermal trip with neon trip blown indicator. Coloured insert to indicate phase. Finished in Black with left hand cable drop. Fitted with a 3m lead to a 16A BS4343 5 pin plug. 48-E4-687-00-16W Vertical, slimline 3 phase PDU with 10 x C13 outlets, 2 x C19 outlets and 1 UK socket per phase. Each phase protected by a 16A thermal trip with neon trip blown indicator. Coloured insert to indicate phase. Finished in White with right hand cable drop. Fitted with a 3m lead to a 16A BS4343 5 pin plug. 48-E4-687-00-B Vertical, slimline 3 phase PDU with 10 x C13 outlets, 2 x C19 outlets and 1 UK socket per phase. Each phase protected by a 16A thermal trip with neon trip blown indicator. Coloured insert to indicate phase. Finished in Black with left hand cable drop. Fitted with a 3m lead to a 32A BS4343 5 pin plug. 48-E4-687-00-W Vertical, slimline 3 phase PDU with 10 x C13 outlets, 2 x C19 outlets and 1 UK socket per phase. Each phase protected by a 16A thermal trip with neon trip blown indicator. Coloured insert to indicate phase. Finished in White with right hand cable drop. Fitted with a 3m lead to a 32A BS4343 5 pin plug. 48-EDP-703-00-B Vertical 3 phase PDU finished in Black. 6 x German Schuko outlets per phase with power present indicator. Coloured insert to indicate phase. Supplied with a 3m H07 rubber cable fitted with 32A 5 pin 3 phase Commando plug. 48-EDP-703-00-G Vertical 3 phase PDU finished in Grey. 6 x German Schuko outlets per phase with power present indicator. Coloured insert to indicate phase. Supplied with a 3m H07 rubber cable fitted with 32A 5 pin 3 phase Commando plug. 48-EDP-705-00 Vertical 3 phase PDU finished in Black, with coloured insert to indicate phase. 3 Phase PDU has 4 x C13 outlets and 2 x C19 outlets per phase with power present neon and 16A thermal trip on each phase. Fitted with a 3 phase ammeter and M6 Earth stud to end. Supplied with 3m H07 rubber cable to IEC 309 32A plug. 48-EDP-820-00 Vertical slimline 3 phase PDU finished in Black, with coloured insert to indicate phase. Each phase has 9 x C13 outlets protected by a 16A thermal trip and neon trip blown indicator. Supplied with a 2m lead to 32A BS4343 5 pin plug. 48-EDP-901-00 Vertical mounted 3 phase PDU finished in Black. Coloured plate indicates phase. Each phase has 8 x C13 outlets with a power present neon per phase. Protection per phase is provided by a 16A MCB. Supplied with a 3m H07 rubber cable to BS4343 32A 5 pin plug, with an M6 stud to end for earthing. 48-EDP-930-00 Vertical mounted 3 phase PDU finished in Black. 7 x C13 outlets and 1 x C19 outlet, with each phase indicated by a different coloured plate. Each phase has a power present neon indicator. Supplied with a 3m H07 rubber cable to BS4343 16A Commando plug. M6 earthing stud to one end. 48-EDP-1028-00-B Vertical mounted 3 phase PDU finished in Blue, with coloured plate to indicate phase. Each phase has 10 x locking C13 outlets, 2 x locking C19 outlets and 1 x UK socket, protected by 2 x thermal trips per phase with 2 x trip status neons. A power meter is fitted to each phase showing volts, watts, amps and power factor. Supplied with a 3m H07 rubber cable to BS4343 32A 5 pin plug. 48-EDP-1028-00-O Vertical mounted 3 phase PDU finished in Orange, with coloured plate to indicate phase. Each phase has 10 x locking C13 outlets, 2 x locking C19 outlets and 1 x UK socket, protected by 2 x thermal trips per phase with 2 x trip status neons. A power meter is fitted to each phase showing volts, watts, amps and power factor. Supplied with a 3m H07 rubber cable to BS4343 32A 5 pin plug. 48-EDP-1030-00-B Vertical 90mm wide 3 phase PDU finished in Blue, with Brown, Black and Grey front plate to reflect phase. 10 x locking C13 outlets, 2 x locking C19 outlets and 1 x UK socket per phase, protected by 2 x 16A thermal trips with trip status neons on each phase. This 3 phase PDU is fitted with a 3 phase energy meter showing volts, watts, amps, kWh and power factor per phase. Supplied with a 3m x H07 rubber cable to BS4343 32A 5 pin plug. 48-EDP-1030-00-O Vertical 90mm wide 3 phase PDU finished in Orange, with Brown, Black and Grey front plate to reflect phase. 10 x locking C13 outlets, 2 x locking C19 outlets and 1 x UK socket per phase, protected by 2 x 16A thermal trips with trip status neons on each phase. This 3 phase PDU is fitted with a 3 phase energy meter showing volts, watts, amps, kWh and power factor per phase. Supplied with a 3m x H07 rubber cable to BS4343 32A 5 pin plug. 48-EDP-1077-00 Vertical 3 phase PDU finished in Black, with three colour plate indicating phase. 8 x C13 outlets and 2 x C19 outlets per phase. Each phase is protected by a 16A Ceramic HC fuse with fuse status neon indicator. Supplied with 3m rubber cable to BS4343 32A plug. 48-EDP-1077-00-I Vertical 3 phase PDU finished in Black, with three colour plate indicating phase. 8 x C13 individually outlets and 2 x C19 individually fused outlets per phase. Supplied with 3m rubber cable to BS4343 32A plug. 48-EDP-1078-00 Vertical 3 phase PDU finished in Black, with three colour plate indicating phase. 12 x C19 outlets per phase protected by a 16A Ceramic HC fuse with fuse status neon indicator. Supplied with 3m H07 rubber cable to BS4343 16A plug. 48-EDP-1078-00-I Vertical 3 phase PDU finished in Black, with three colour plate indicating phase. 12 x C19 individually fused outlets per phase. Supplied with 3m H07 rubber cable to BS4343 16A plug. 48-EDP-1146-00 Vertical 3 phase PDU finished in Black, with Brown, Black and Grey phase indicating plate. 8 x C13 per phase protected by 2 x 16A thermal trips with trip blown neons. Supplied with 3m H07 rubber cable to IEC 309 32A 5 pin plug. 48-EDP-1189-00-N Vertical 3 phase PDU with 18U fixing centres finished in Black. Three colour phase indicator plate. Each phase has 4 x C13 outlets and 1 x C19 outlet, along with power present neon. Supplied with 3m H07 rubber cable to BS4343 5 pin 16A plug. 48-EDP-1189-00-A Vertical 3 phase PDU with 18U fixing centres finished in Black. Three colour phase indicator plate. Each phase has 4 x C13 outlets and 1 x C19 outlet, along with power present neon. PDU fitted with true RMS 3 phase digital ammeter and supplied with 3m H07 rubber cable to BS4343 5 pin 16A plug. 48-EDP-1190-00-N Vertical 3 phase PDU with 27U fixing centres finished in Black. Coloured insert to indicate phase. Each phase has 8 x C13 outlets and 3 x C19 outlets along with a power present neon. Supplied with 3m H07 rubber cable to BS4343 5 pin 16A plug. 48-EDP-1190-00-A Vertical 3 phase PDU with 27U fixing centres finished in Black. Coloured insert to indicate phase. Each phase has 8 x C13 outlets and 3 x C19 outlets along with a power present neon. PDU fitted with true RMS 3 phase digital ammeter and supplied with 3m H07 rubber cable to BS4343 5 pin 16A plug. 48-EDP-1191-00 Vertical 3 phase PDU finished in Black. Coloured insert to indicate phase. Each phase has 12 x individually fused C13 outlets and 4 x individually fused C19 outlets with fuse status neon per oulet. Supplied with 3m H07 rubber cable to BS4343 5 pin 32A plug. 48-EDP-1191-00-A Vertical 3 phase PDU finished in Black. Coloured insert to indicate phase. Each phase has 12 x individually fused C13 outlets and 4 x individually fused C19 outlets with fuse status neon per oulet. PDU fitted with true RMS 3 phase digital ammeter and supplied with 3m H07 rubber cable to BS4343 5 pin 32A plug. 48-IP2-077-00 Vertical iPower 2 3 phase 63A PDU with per socket monitoring. Coloured insert to indicate phase. 4 x C13 outlets and 4 x C19 outlets per phase protected by 16A B curve MCB per 4 x C19 and per 4 x C13 per phase, both fitted with power present neon indicator. Supplied with 3m H07 rubber cable to 5 pin IEC 309 Commando plug. 48-IP-212-IP4 Vertical iPower 2 3 phase 63A PDU with overall monitoring, per port switching and environmental monitoring. Coloured insert to indicate phase. 8 x individually fused C13 outlets, 2 x individually fused C19 outlets and 1 x UK socket per phase, with power on neon per outlet. Supplied with 3m H07 cable to IEC 309 63A 5 pin plug. 48-IP-279-IP3 Vertical iPower 2 3 phase PDU with per port monitoring and switching and environmental monitoring. Coloured insert to indicate phase. 12 x individually fused C13 outlets with power present neon on each phase. Supplied with 3m H07 rubber cable to IEC 309 16A plug.